In dating and competitive Pokémon, those base stats matter. There are four factors that impact the maximum capacity that a Pokémon can have in each of its stats (the stats are: HP, Attack, Special Attack, Defense, Special Defense, and Speed). The factors are the base values for the stats, IVs or individual values, EVs or effort values, and Nature. While IVs, EVs, and Nature impact how your Pokémon grows over time, the base stats are the point where all Pokémon are "created" equal. You will never come across a Diglett with different base stats from any other Diglett. I think most people keep some kind of list of the qualities they are looking for in a date - tall, dark hair, mediterranean features, good sense of humor. Some people (i.e., me) create spreadsheets of Pokémon base stats so that i can examine the features I am looking for in a Pokémon. Yes, I have done frequency analysis on some factors, compared averages across stat spreads, ranked on a specific stat, and potentially used advanced statistical analysis software to evaluate my options. What can be truly worthwhile, though, is just having a sortable list of Pokemon so you can easily compare base stats side-by-side. When you look at Pokémon by comparing base stats in a table, you start to notice a few trends. There is not a smooth allocation of base stat totals (HP+A+SA+D+SD+Sp) from the lowest (Sunkern at 180) to the highest (Arceus at 720). Instead, they group around certain point totals. At the high end are those Pokémon in the 600 club - their base stats all add up to 600. Some of these cannot be used competitively (who makes these rules!?) and there are two that are at 670 that can be used in competitions. Competition season is starting to heat up again (2012 International Challenge in March and Regional Championships on April 15); so I wanted to talk about some members of the 600 club that you might consider as a cornerstone of a team you are forming. On one hand, many people are expecting you to pick from these - they are the strongest Pokémon you can get, on the other hand, anyone who just got into Pokémon with Black and White may not be as familiar with the powerhouses from previous generations. As always, your mileage may vary. That brings us to the Pokémon of this week - Tyranitar. Now, I have to admit, Tyranitar is that guy we're all a little embarrassed to be dating. He's a jock. He's all muscle and no grace. Yes, he's handsome. Yes, he does nice things for you. He'll even bring you flowers. You sure were embarrassed, though, when he snored that time you went to the orchestra. When you have Tyranitar on your team it's all about the BOOM. He brings the shock and awe. Your opponent will know that you have shown up with a nuclear bomb and not a dagger. In my minimal experience with structured competitive random battles (that is, not with my friends) speed and power win out over finesse and strategy most of the time. Tyranitar is a weirdo. Think about it. His pre-evolutions (Larvitar and Pupitar) are both Rock/Ground-types and Tyranitar comes out as Rock/Dark. Consider also that Tyranitar's pre-evolution concepts are insect-like (pupa and larva) but it isn't a Bug-type. This Pokémon's ability changes with each successive evolution. So he's kind of this weird bug that grows up to be a . . . dinosaur. 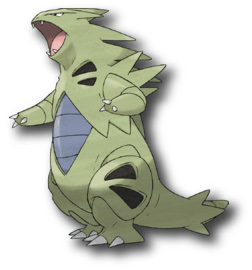 I would also argue that Tyranitar has the most visually displeasing depiction of any Pokémon (weak chin, pot belly, oddly arranged spikes). No, I wouldn't go on a second date with him. Be that as it may, Tyranitar brings power to your team. Base stats for HP, Attack, Defense, and Special Defense are all over 100, Special Attack is at 95. Base Speed is at 61 (slowest of all the 600 club); this is actually a good thing. You are going to get the biggest bang for your buck if you aim your EVs, IVs, and nature at HP and Attack but Tyranitar's stats are sufficiently close that you could do well applying them to any of the others except speed. Leave speed alone (or even let t drop). Why do you want a slow Tyranitar? Because the standard ability for Tyranitar is Sand Stream. Wherever this guy goes, a sand storm follows. Having spent some time in the Middle East I can testify that a sand storm is far more unpleasant than your worst rainy day. This is also true in Pokémon battling. Opponents (and allies) who aren't Rock, Ground, or Steel-types will take damage every turn. Anyone in the battle with the Sand Rush ability will get a speed boost (compensate for your Tyranitar?) and anyone with Sand Force will have Rock, Ground and Steel-type moves power boosted. If multiple Pokémon with weather bringing abilities (Sand Stream, Snow Warning, Drought, Drizzle) are in battle at the same time, the overriding weather effect will be the one coming from the slowest Pokémon or the most recent one to enter battle. If you are able to keep a sand storm going, keep in mind that Special Defense for Rock-types will be boosted by 50% as long as it lasts. I shall quietly mention that Tyranitar can have the Dream World ability Unnerve. Unnerve prevents your opponents from eating held berries during battle. I could be wrong, but I don't see that many people using berries as held items (unless it's a Braviary holding a Charti berry) in competition. Balance your Tyranitar between STAB moves and other moves that compliment how you have trained it. Pick a Dark-type move (Dark Pulse for a Special Attacker, Crunch for a Physical Attacker), a nice Rock-type move (Stone Edge), a Normal-type move for broad coverage (Giga Impact, Thrash, or Hyper Beam), and one of the Fangs (Thunder Fang, Ice Fang, or Fire Fang) if you think you are going to come across a particular type match up. Tyranitar is not getting hit by any Psychic-type moves, but it does have a four times weakness to Fighting-type moves. A Chople Berry will halve a super effective fighting type move, once. Unfortunately, those fighting type moves tend to hit more than once. Power boosters include the Hard Stone (Rock-type moves up 20%), Silk Scarf if you're focusing on Normal-type moves, Rock Gem (one time 50% boost), and Rock Incense. If you like Choice items stay away from the Choice Scarf. Use the Life Orb on a Tyranitar that has been trained up for high HP. Would I go out with Tyranitar? Well, no doubt he has excellent stats. He's powerful and has a lot of tricks up his sleeve. Honestly, though, he's not the kind of guy I could have a lasting relationship with. The unique and artsy Wobbuffet is more my type.